Beko freezers offer a variety of stylish freezer solutions for the home. From compact freezers for small kitchen spaces to large capacity units perfect for outbuildings, the Beko freezer range uses clever technology to cut down on energy use too. Beko freezer units come in a range of sizes, capacities and finishes to suit every need. Undercounter and integrated Beko freezers fit neatly into any kitchen, providing capacities of 85 litres or more. Tall, freestanding units are available in slick silver, classic white and striking black, with up to 250-litre capacity – perfect for family use. 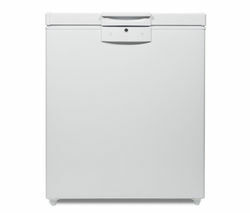 The Beko freezer range also includes large capacity chest freezers. Most Beko freezers are suitable for outbuildings too, giving you greater freezer storage flexibility for the home. Beko's intuitive Freezer Guard technology ensures safe operation even if the outside temperature drops as low as -15°C, so storing your freezer in a garage or outbuilding isn’t a problem. All Beko freezers are frost-free and feature a handy fast freeze function that quickly freezes fresh items, helping to preserve nutrients and taste. Reversible doors make it easy to position your freezer just where you want, while A+ energy ratings help you cut down on energy bills. Whatever your freezer needs, there’s a Beko freezer to fit. For an even wider selection of freezers styles and capacities, check out our full range of Hotpoint freezers and Bosch freezers too.